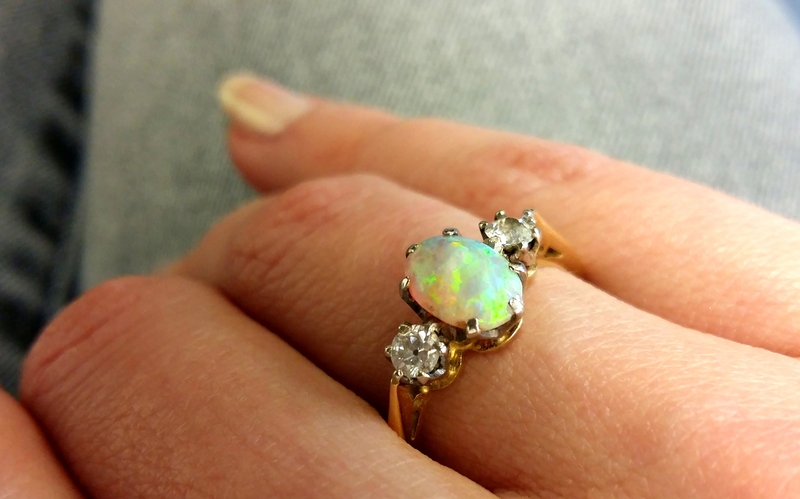 I have a few pictorials concerning split rings waiting to be shared for some time. To get things moving, I am uploading as a post now, and will convert to pdfs soon, including the sew-free hiding of tails in SR pictorial. When working a pattern with numerous split rings as in a braid, the shuttle that is used for the core thread empties faster than the 2nd shuttle. Despite starting with equal lengths in both shuttles, the core thread uses up an extra length, hence the mismatch in usage. In another scenario, we may have just enough thread in shuttle 1 to make the stitches of the ‘last’ ring but not enough to form the core. 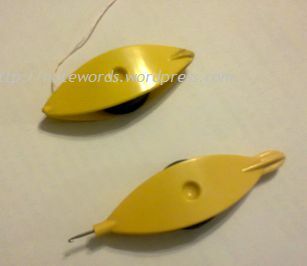 If we are working with same colour in both shuttles, we could use an overhand knot or shoelace trick (SLT) to switch shuttles, thus emptying both shuttles equally. But what if it is a 2-colour braid? The SLT will cause a switch in colours. It also creates the tiniest bit of knot which I personally dislike. 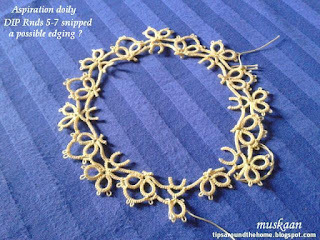 Each split ring in this braid is 8ds/8ds. There is a very small mock picot between rings. 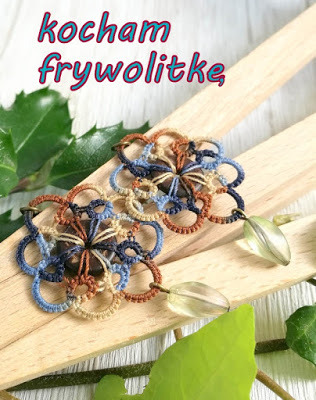 Shuttle1 (red) – cream thread ; Shuttle2 (blue) – variegated thread. 1. I tatted over tails on either side for a knot-free start to split ring. Middle path mantra was followed. 2. Complete the ring, tug and snip off extra tails. 4. Continue tatting split rings normally, using shuttle1 for core thread. or we want to use up some of the shuttle2 thread, Turn the work over. (notice the shuttles have now switched positions). We will now be working from the backside. 6. Start next split ring with shuttle2 (1st side of SR made - notice core thread). ie. second half stitch, first half stitch. Stitches are flipped. 7. Now work 2nd (unflipped/reverse stitch) side with shuttle1. 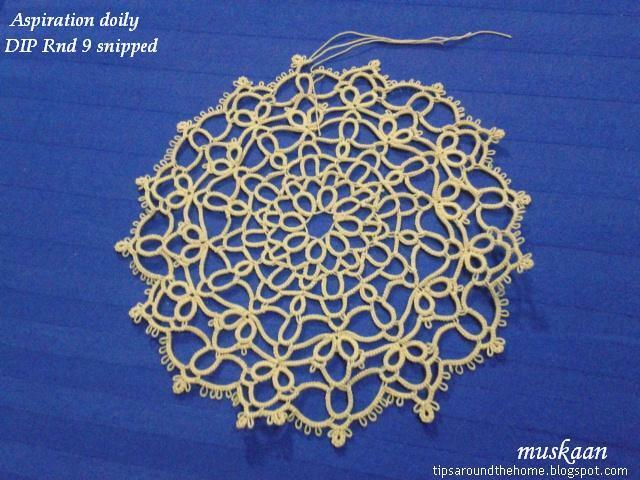 Make discretionary changes in case of directional or frontside/backside tatting. 8. Pass shuttle2 over-under, through the ring. This is optional. I used directional tatting, and posting the shuttle works for me. 9. Shuttle2 is now on the ‘front side’ and ring can be closed. or add new thread (2nd scenario) as the case may be. whether they are worked with shuttle1 or shuttle2 !!! No doubt I will inform (and update with link here) when this is converted to a pdf; but in case you miss the notification, you can always check here. I look forward to your feedback and suggestions, or tips on how you do it. Please do share. I like switching options in tatting and hope you do too. Pattern for the Poinsettia is ready! I do try to follow along, but leaving comments has been stymied due to erratic server on my desktop. Even this pattern and it’s conversion to pdf has been through a circuitous route through multiple devices. But I’d promised Carollyn! And the silver lining is that I learned something new! This enclosed space medallion is constituted of inward facing clovers connected with chains and thrown/floating rings. 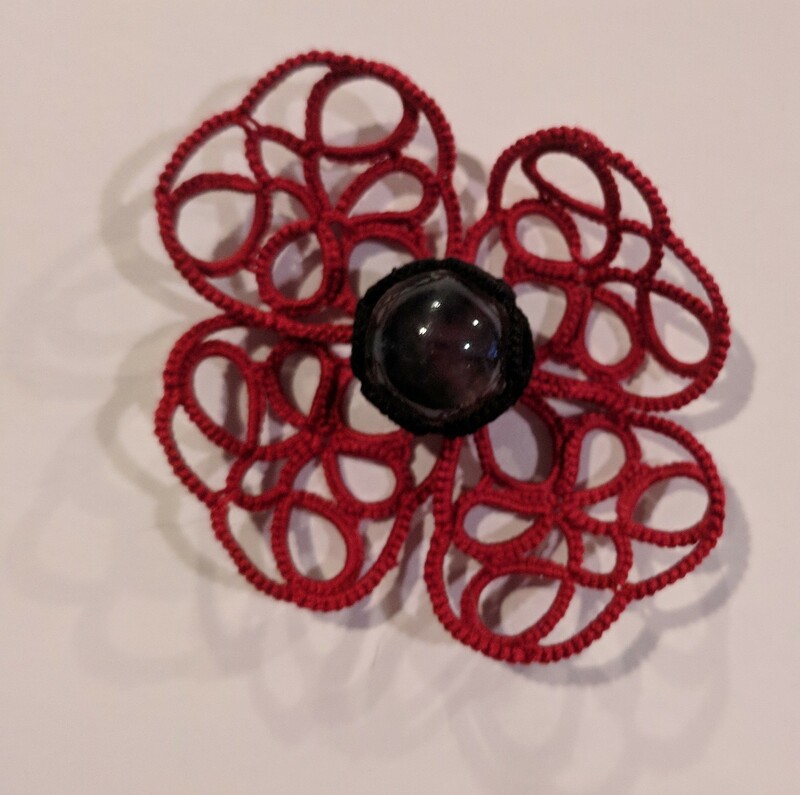 All beads are pre-strung and moved along the picot thread (not the core thread) – Nina Libin calls them “up’ beads. In case of any doubts or questions, feel free to leave a comment or email me. I hope you enjoy tatting this as much as I did. Meanwhile, I’ve been spending time joining the clover wreath medallions into mats. 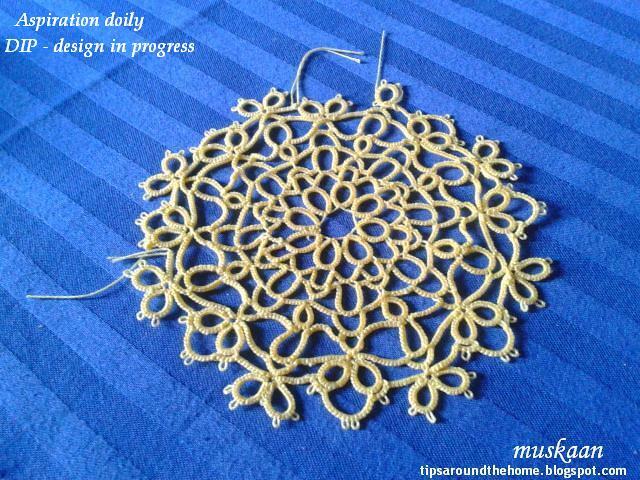 One coaster is complete & I have sketched a tentative edging for it. Need to put it to shuttles. But here’s a peek into a bunting formation – just right for the holiday season if the colours are changed. Add a ribbon or straight header for hanging. And if one wants triangles, simply join another medallion at the tip. 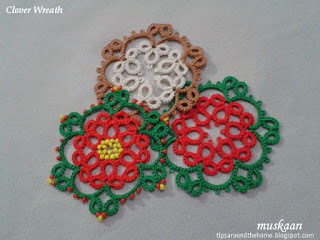 The medley is limited to my newest clover wreath pattern. This medallion has turned out to be quite versatile. ... except adding joining picots to stabilize the center. Placed a lone rosette in center to see the effect. Red and gree also remind me of poinsettias ! All it needed was a touch of yellow in the center. Beads to the rescue. With 3 medallions made, it was time for some more play. I noticed how snuggly the hexagons fit together for a larger mat. A tiny picot on the ‘leaves’ to attach adjacent medallions. 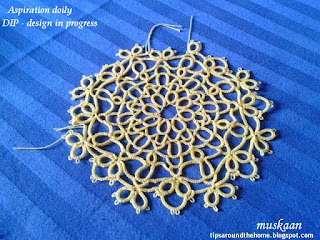 Immediately started to work on the larger coaster, using 3 strands of embroidery thread. Attaching linearly this could well become a broad insertion, bookmark, belt, hairband, etc. Multiple rows could create a table runner, a cornered mat. It would leave some empty spaces to fill in, though. So far I've attached 3, then stopped to do a teensy bit of experimentation before I write and share the pattern. Oh, yes ! And I should’ve included this in my study instead of simply listing Nicholls’ categorization. 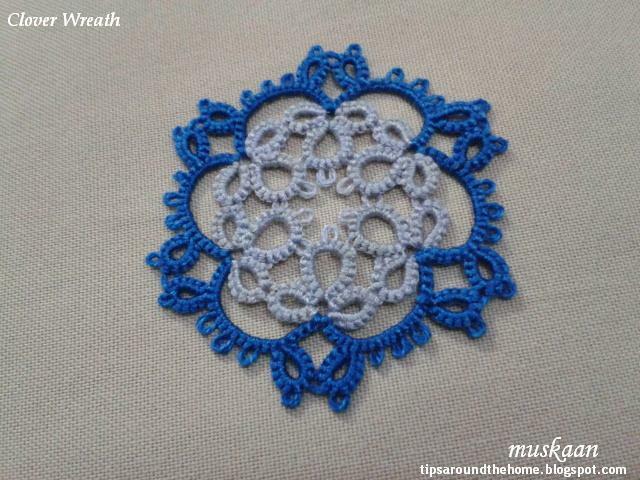 whatever the tune played, a tatting medley is always melodious ! Medallions are complete in themselves, yet lend themselves to various uses. 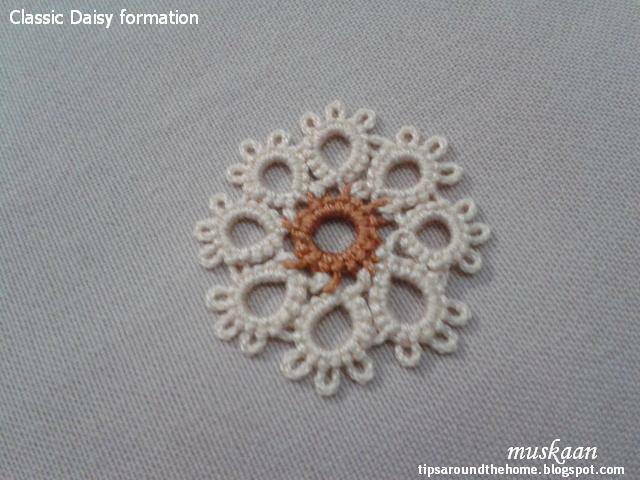 Most commonly we see them as centers in snowflakes, doilies, etc. At other times they act as motifs joined or tiled to create larger mats, etc. It works well as a stand-alone piece (medallion) but also great when more are joined around (as motifs) – see Carla’s model and pattern. This is one of those designs that always appeals to me. Elegant arches and offset rings. A triangle with 3 large rings ; a square with 4 large rings, and here a cute little flower is formed! Tatted with 3 strands of Anchor embroidery thread for a choice of colours, although colour fidelity is missing in the photographs. As often happens we name a pattern 'rosette' for the visual effect, but technically this one is a medallion with an enclosed space formed by inward facing rings. a central ring with close chains lock joined to the picots (as in the famous Sitka Rose by Georgia Seitz). 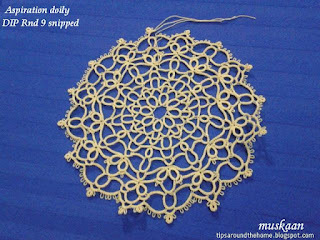 A medallion is made of pattern repeats called motifs. 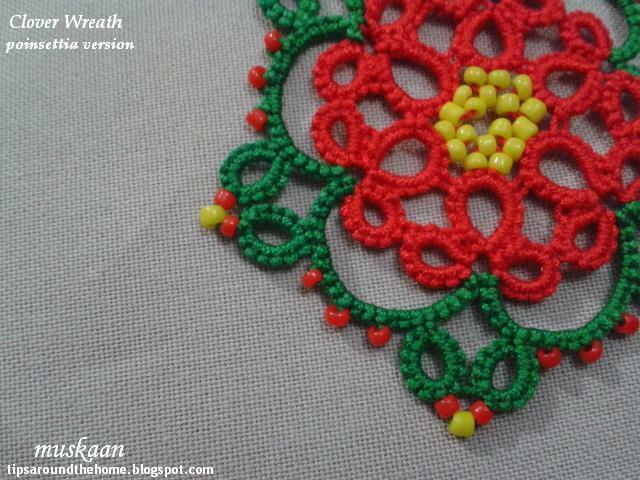 Yet a medallion itself can become a motif in a larger pattern/design when it is repeated and joined. 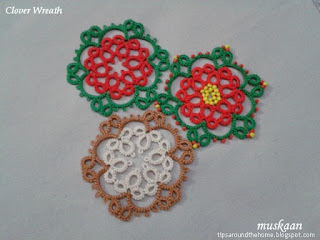 I had loaded my shuttles to work Carla's larger pattern, but I discovered my Clover Wreath works well as a motif, too. So I switched to the latter and will share in next post, along with a Christmasy version. 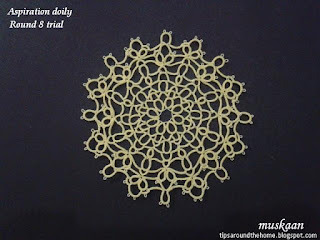 Also relieved at finally finishing the medallion document - there is a short note on rosettes, too. It took a long time with lots and lots of tweaks, but I am finally happy with it. And in the process I have learned a great deal myself. Have sent it to Susan Fuller and will share it here after she discusses it in design class. Going over the medallions document, I realized that it needed more samples – visuals are so much better than words. Excited, I got down to it. Here are a few of them. Most of the samples in the document seemed to have single rings around the center. But trefoils, clovers, layered rings (ANKAR style), etc. can also form an enclosed space. So I created this pattern using inward facing clovers. There are thrown rings on the chains. ‘Tis the season, hence I’m calling it the Clover Wreath. 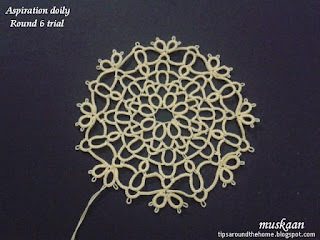 Wouldn’t it work well as the center of another doily ?! The large rings need to be joined, though. 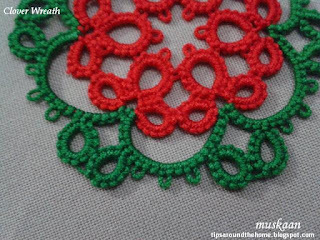 Now here’s something I don’t remember ever doing – a Central/common Picot on a Chain. I tried to create my own pattern with 1 horizontal and 1 vertical ring on each ‘spoke’, but it wasn’t working (do you have any idea why?). Finally I took the design idea from the model #69 in Elgiva Nicholl’s ‘Tatting: Technique and History’ but used my own stitch-count and single decorative picots. TIP: For straight chains, avoid snugging the chain too tight – we don’t want it to curve/arch. 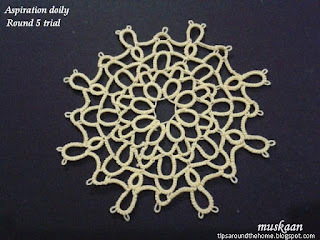 A central ring with picots (also called rosette by Mlle Riego) is a common feature of many patterns. Traditionally it was tatted separately. Now we have multiple options to incorporate it without cutting off thread : climb out with a mock picot ; work it as a mock ring ; and so on. When I was first learning split rings during Jane's TIAS 2014, I attempted the Fandango coaster to practice on the side. So not happy with the working ! Time to try it again. Much better. This is a Classic Tatted Daisy. It starts with a central ring with picots. Then we add a round of outward facing rings – lock joined to the picots and separated by bare thread. Traditionally it was worked as separate rounds and with a single shuttle, hence bare thread separates adjoining rings. Now we make it in one pass and the bare thread is sometimes substituted with chains. 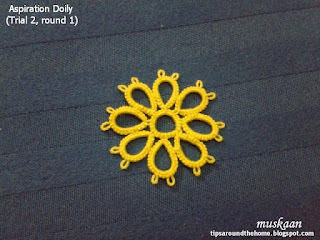 Incidentally, my Aspiration Doily (trial 2) now has a Daisy center ! It is a modern construction using 2 shuttles (or a long tail for shuttle 1) with the outward rings/petals thrown off the central mock ring (SCMR). It lies flat and the center is more solid than bare threads between rings in previous trial. a central ring with picots, surrounded by concentric chains, lock joined to picots on previous rounds, and a final round tatted like the traditional daisy petals with bare thread and lock joins ! 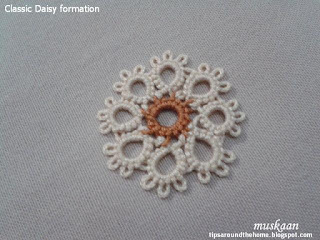 So, the rosette turns into a daisy ! These were tatted over 15 years ago when I had no notion of a lot of tatting techniques nor how to hide ends. You can clearly see spiraling rounds rather than discreet ones. Although I did get better over time and in one of the size 40 yellow ones (made a few years after the size 20 red), the inner circle is almost round with equal-size picots. 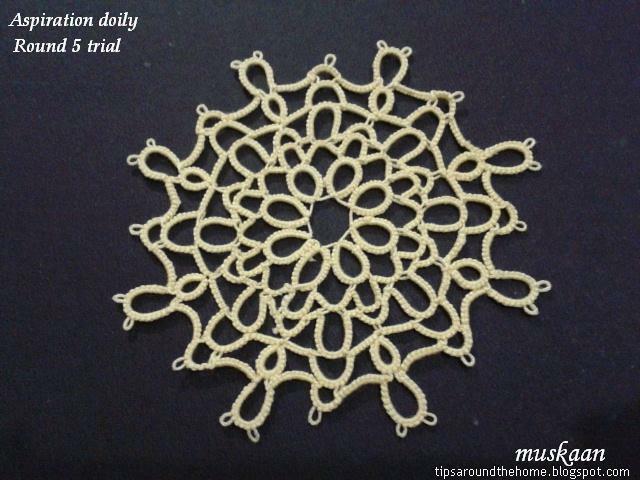 Pattern is part of a lace from ‘Tatting Favourites’ by Anchor Design Center. Each medallion is worked in 2 parts but I now realise that the outermost rings can be worked as thrown rings. It has been one of my favourite go-to patterns when travelling. The medallions were later joined with a wavy scroll with opposing medallions, thus functioning as motifs. Medallions – never too meddlesome when tatted ! I have no idea where I got this lovely pattern or when. 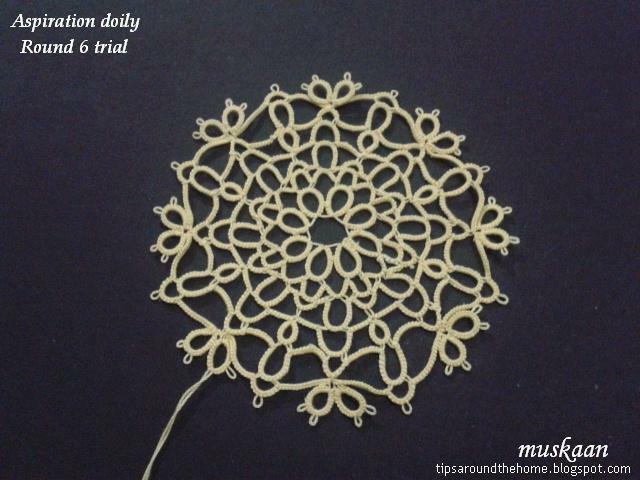 UPDATE Nov, 2017 : This is Medallion #84 with pattern on page 23 of Il Chiacchierino Vol 1 1999. Years back I had made several (in blue and white) and have since given them away to my MIL, except for a couple. This was shared as part of “the flower within” series of snowflakes. Last couple of days I tatted these afresh, for a document on medallion classification I was preparing (for Design Class). It will be shared soon – with explanation and respective samples. Based on Elgiva Nicholl’s book (Tatting: Technique & History), these medallions come under the category of ‘enclosed space’. Notice that there is a central negative space surrounded by rings. Traditionally this medallion is tatted in 2 separate rounds – the inner rings-only round and then the outer one with clovers and chains. When done in this fashion, the rings face outwards and we also have a choice of using 2 different colours for each round. (We can climb out with a split ring, though. Even with single shuttle and ball, pull a length of tail to be used for the last split ring). 20th century tatters like to tat in one pass. The easiest way in this case is to work the inner round as thrown rings off the chains, using 2 shuttles. Yes, the rings are now facing inwards ! We thus have an enclosed space with inward facing rings. And the inner rings will take the chain colour, being tatted with 2nd shuttle. 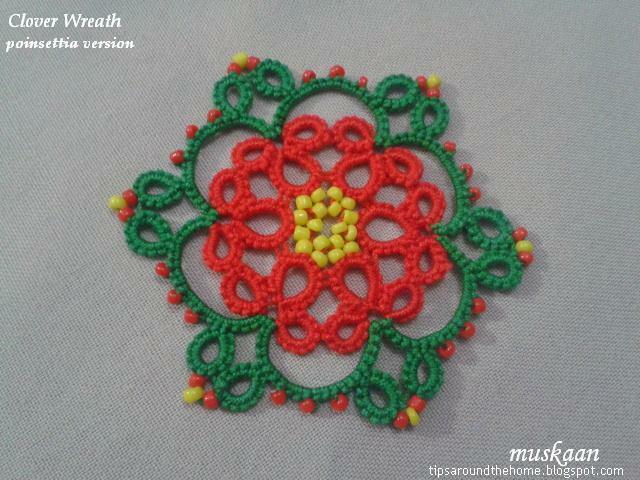 I like the flower within medallions, but the one-pass medallion is quicker and easier to tat. The 8 rings of the ‘flower’ tend to overlap until joined (one can add tiny joining picot at base of each ring to stabilize). The variegated (embroidery, 3 strands) center one is in size 40 (equivalent to size 40 Lizbeth). How can one combine threads (same brand, same ‘size’) for a pattern ??? Anchor (Madura Coats, India) has really gone down the dumps – not just in size ; even the smoothness and silky sheen are missing! I was hoping to create something new - I have something in mind, but in case I don’t get the time, this is my entry for now. 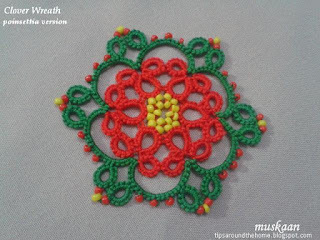 Do check in the other entries – lovely tatting as always ! tatting is always a picnic to be enjoyed thoroughly ! 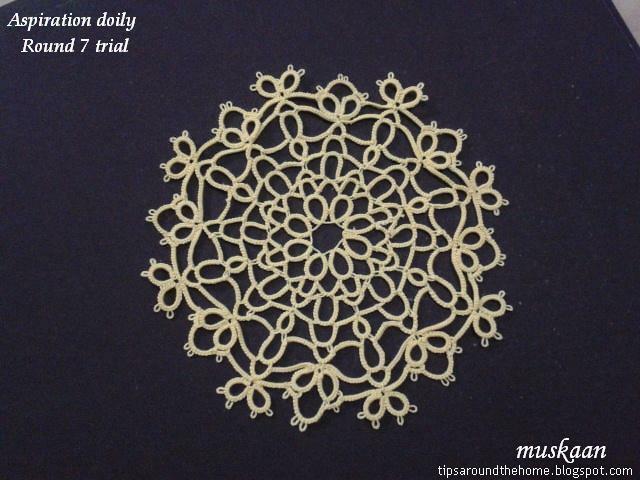 Aspiration Doily – Trial 1 completed ! Despite all my gyan about designing a doily, I had to snip off rounds ! Why is it that mistakes show up at a late stage ? Why is it that the camera catches that one mistake/tweak in the entire round that you missed unintentionally or intentionally ? Why does it take an entire round to zero in on the right stitchcount ? After posting the pics last time, I started on the 7th round and only at the final repeat did I notice that some of the long ring-like chains in Rnd 6 were distorted. Now I had been experimenting in Rnd 5 as well but had let the mistakes remain. What's one round more to snip ?Hence decided to snip off all 3 rounds and re-tat. Yes, much better. But hey, look, is that a possible edging pattern ?! So far I had fun doing it. Shouldn’t make it a habit now! In size 40 thread, it measures just over 5 inches ! I could continue (had sketched a different round 9 & 10), but ending for now. I’m happy with the last round. 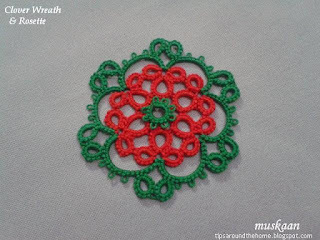 Some enthusiastic Craftreans confirmed that I did not really need decorative picots in the inner rounds. We all like how the picots in last round give the final emphatic finish, though. All 9 rounds can be tatted in one pass using split rings or split chains to climb out. However, I am writing the pattern for each round separately. Only the composite diagram will indicate the continuous path in a different colour - easy for an advanced tatter to work out. 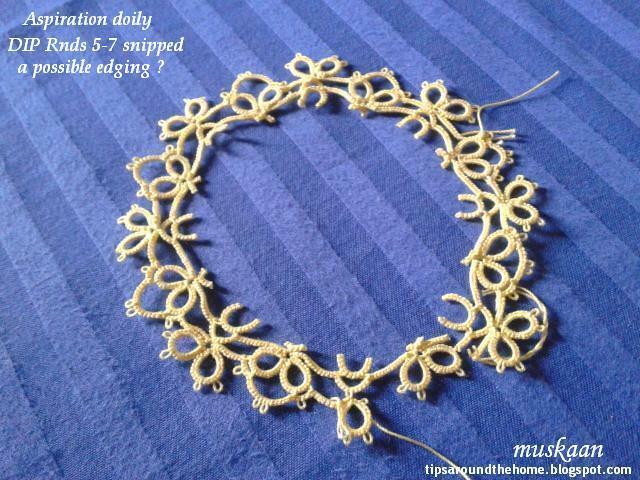 Without split rings & split chains, it becomes a doily for all levels. So what's your verdict, dear readers ? 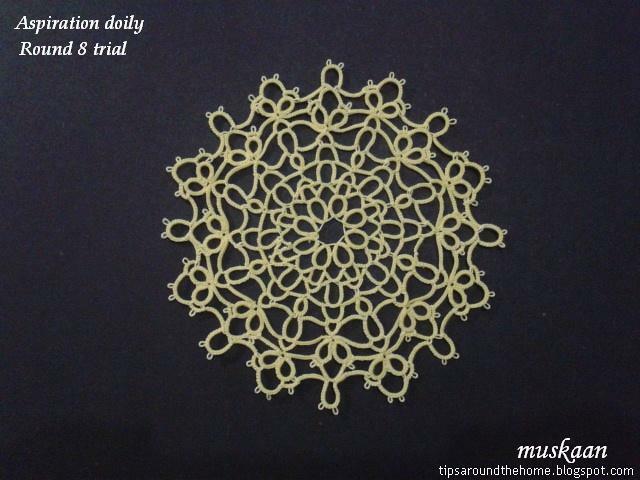 A good first attempt at designing a doily ? 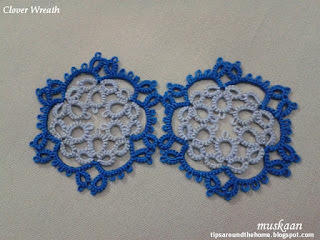 We don’t have to go far to enjoy every bit of tatting !